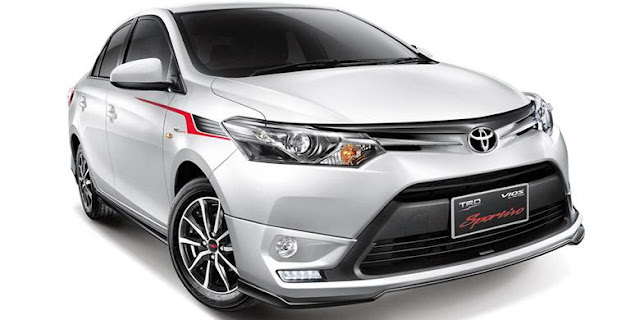 Toyota Vios TRD Sportivo version in Thailand look more cool with the new design. This refresher models have been officially launched at the White Elephant Affairs, on Friday (15/05/2015). Observed from a variety of photo released by Toyota Thailand, the most obvious difference compared to the previous S TRD visible on the top of the grille slats black replace chrome in the standard variant, a wide position, LED daytime running lights (DRL), and the new design of the front bumper. In addition, consumers also get a revision of the style of Thailand on the rear bumper and side skirts, chrome exhaust tip, and the design of the new 15-inch rims. In the cabin most elegant black interior layer plus plus reverse camera. Game shape, color, and material, was refreshing for this compact sedan. Even so, it is still the same as before TRD Sportivo kit for ASEAN does not touch the mechanical system. So 1NZ-FE engine remains the same powerful 1.5L 109 tk and 141 Nm of torque. Differences with Indonesia, TRD Vios S fill the medium variant in Thailand. Price Vios TRD S priced at 694,000 baht or Rp 270 million. While in Indonesia, TRD Vios S be the top variant, sold Rp 300 millions.